The office is designed with a Hill Country look and feel. Custom built in 2000, guests are welcomed with warm and inviting high end hill country décor. The latest technology is at your fingertips while enjoying the finest art work, furnishings, and decorator touches throughout the facility. Clients will be impressed with the high end look and feel of such an exquisite office. 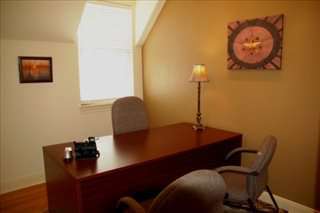 The office is located in the heart of the business district on Main Street. This neutral location is just one block off of Hwy 281 and 6th Street. This office space on 600 Main Street, Marble Falls is available immediately. Details and prices are available by calling 1-877-693-6433 or by submitting the inquiry form. Please fill out the short form at the top of this page to get full information about this office space, including the best rental prices we have available. 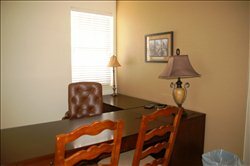 Click here for other office space and executive suites to rent in Marble Falls.